SCVHistory.com | Newhall | Wildwood Sanatorium in the News, 1920s-1940s. Wildwood Sanatorium in the News. The Newhall Signal | April 1, 1926. 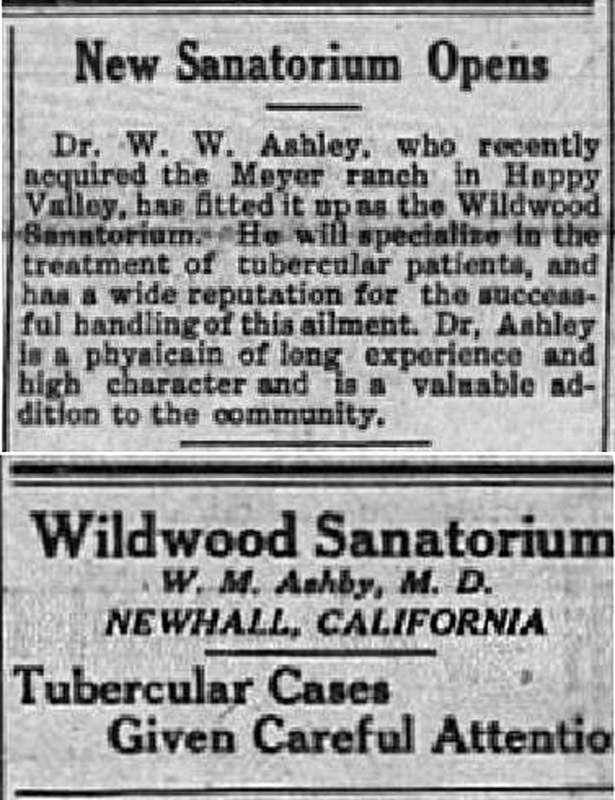 Dr. W.W. Ashley, who recently acquired the Meyer ranch in Happy Valley, has fitted it up as the Wildwood Sanatorium. He will specialize in the treatment of tubercular patients, and has a wide reputation for the successful handling of this ailment. Dr. Ashley is a physician of long experience and high character and is a valuable addition to the community. (Advertisement) Wildwood Sanatorium / W.M. Ahsby [sic], M.D. / Newhall, California / Tubercular Cases Given Careful Attention.